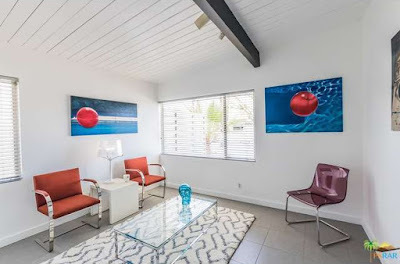 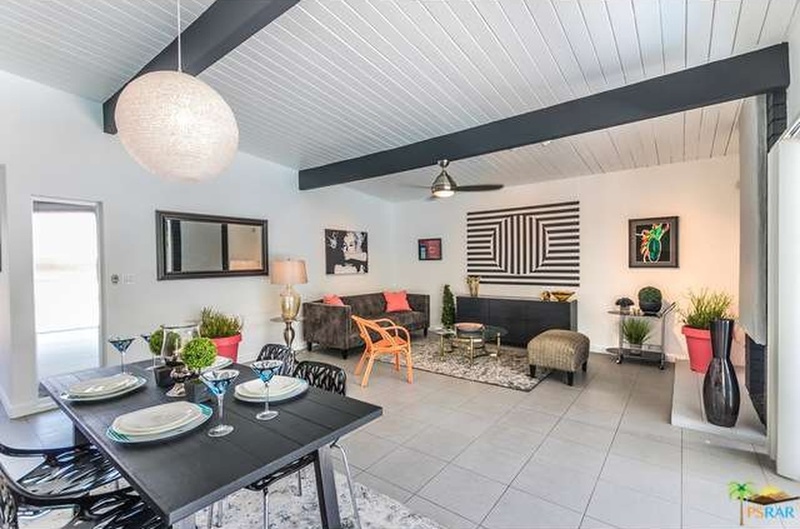 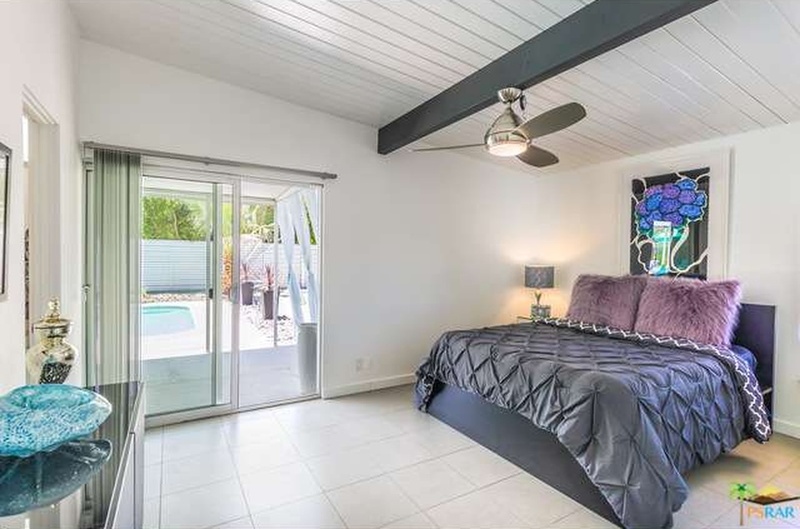 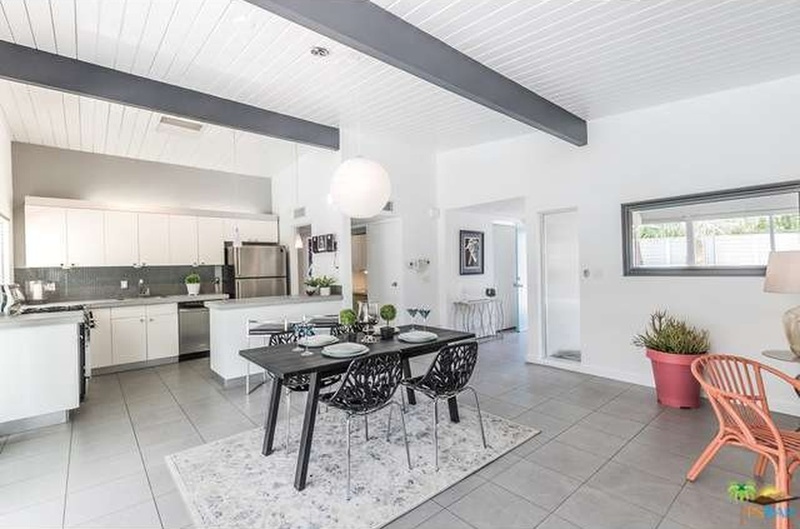 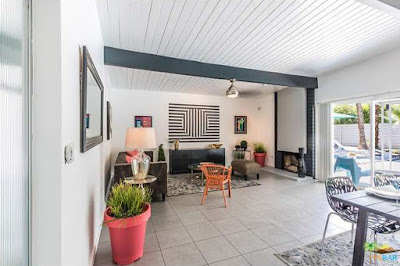 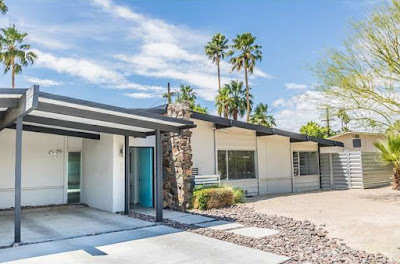 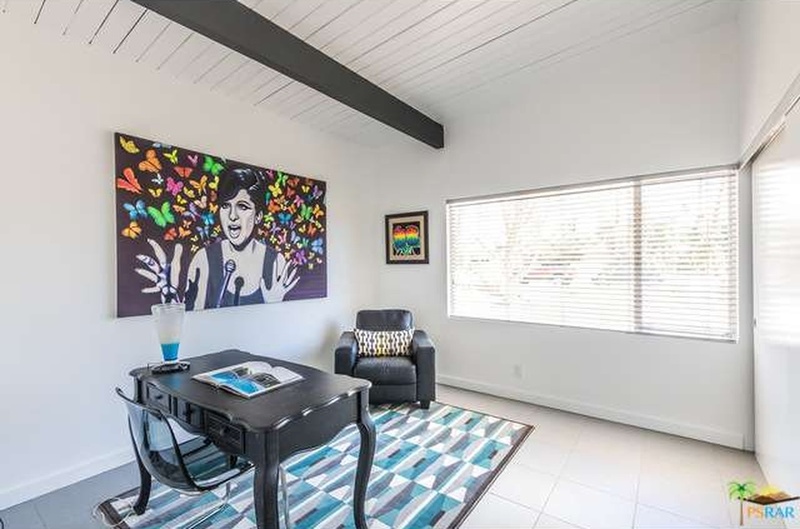 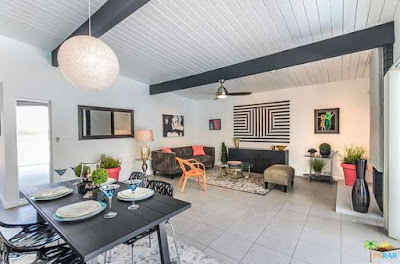 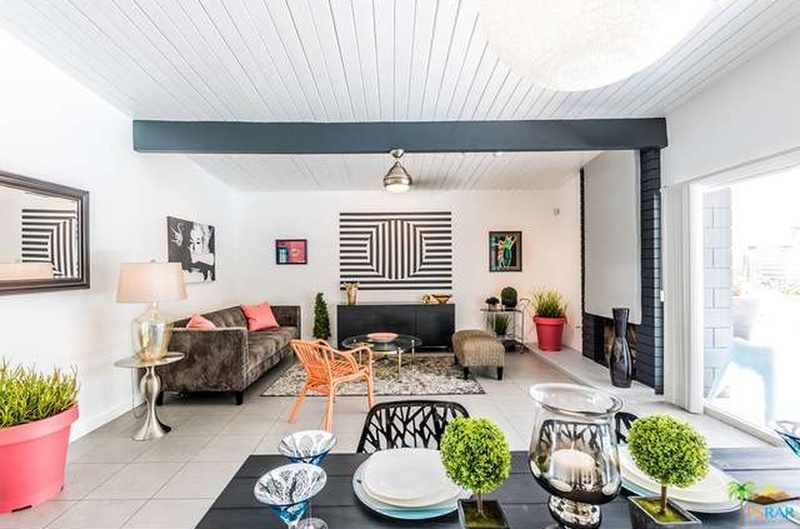 Built in 1958 by the Alexander Construction Company is this Palmer & Krisel-designed home up for sale in the Sunrise Park neighborhood, adjacent to Sunmor. 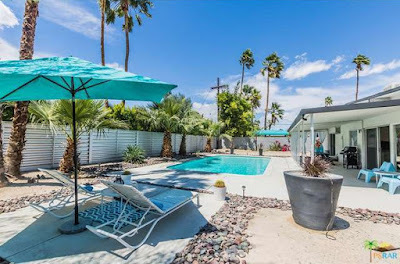 With three bedrooms and two bathrooms in 1,296 square feet and a large in-ground pool on a 10,000 square-foot lot, this home carries an asking price of $599,000. The east-facing front yard features low-maintenance desert landscape, with varied rockscape and a floating pad driveway. The sprawling double A-roofline of this home creates a great street presence, and an original stone accent wall sits adjacent to the entry. 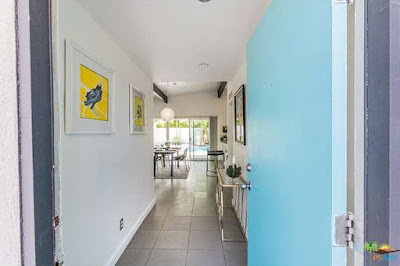 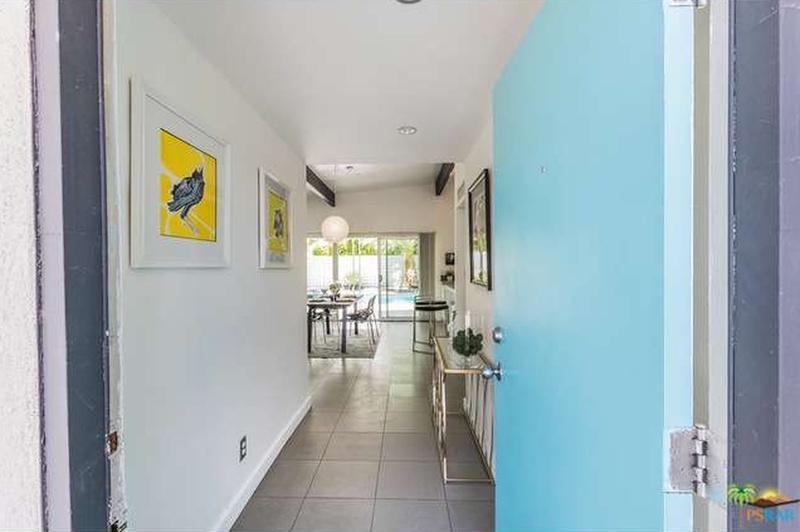 The light blue door leads into open living and dining rooms which overlook the backyard. 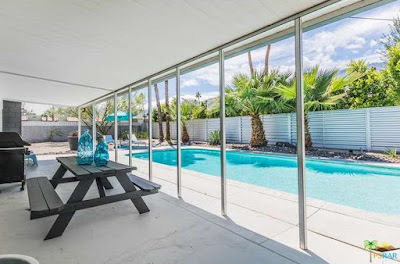 Original open beamed vaulted ceilings add height and volume to the space, and large sliding glass doors offer a strong sense of connection to the outdoors. 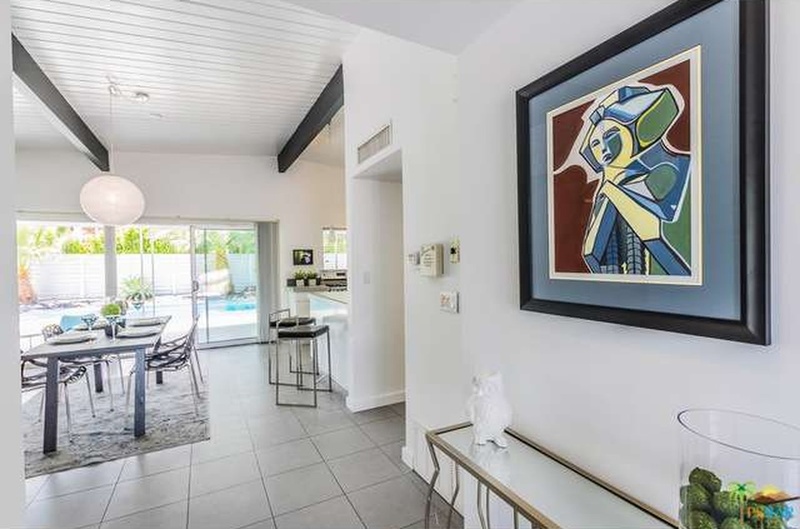 A signature Krisel modernist fireplace anchors the rear wall of the home, and a large modern globe light fixture defines the dining area. 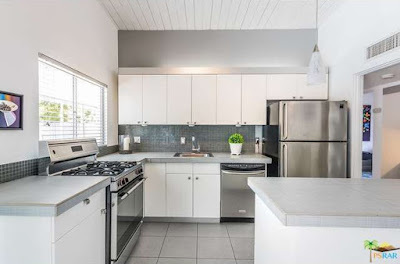 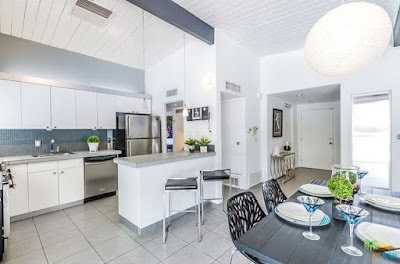 The kitchen sits open to the living and dining rooms, and features clean-lined updated cabinetry, clean grey counter and stainless steel appliances. 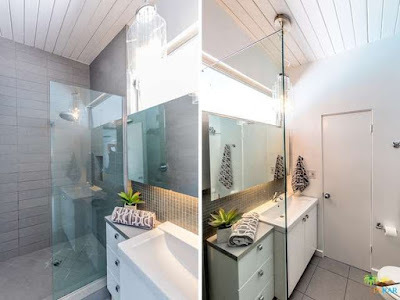 Grey accent paint, gridded mosaic tiles and above cabinet lighting add a sleek modern touch to the room. The secondary bedrooms sit at the front of the home, overlooking the front yard, while the master sits at the back of the home. 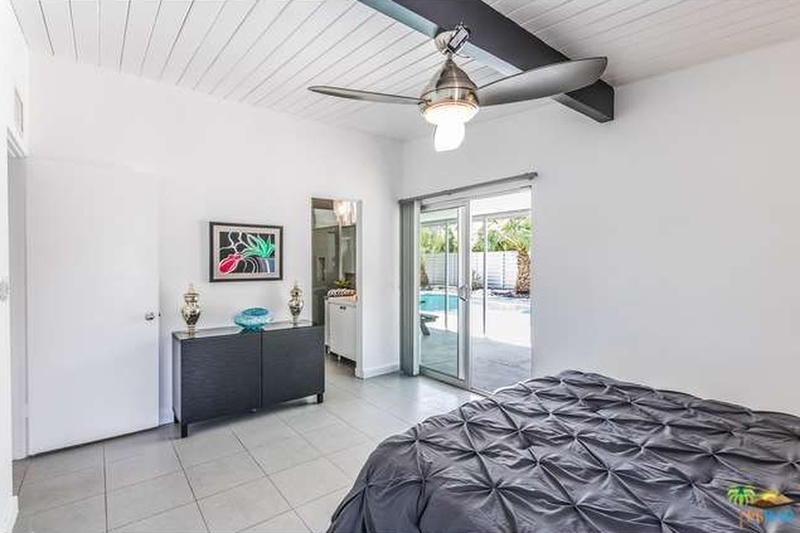 A large sliding glass door in the master accesses the rear yard, and both the master and secondary corner bedroom feature side wall windows allowing for additional light to flow into the rooms. 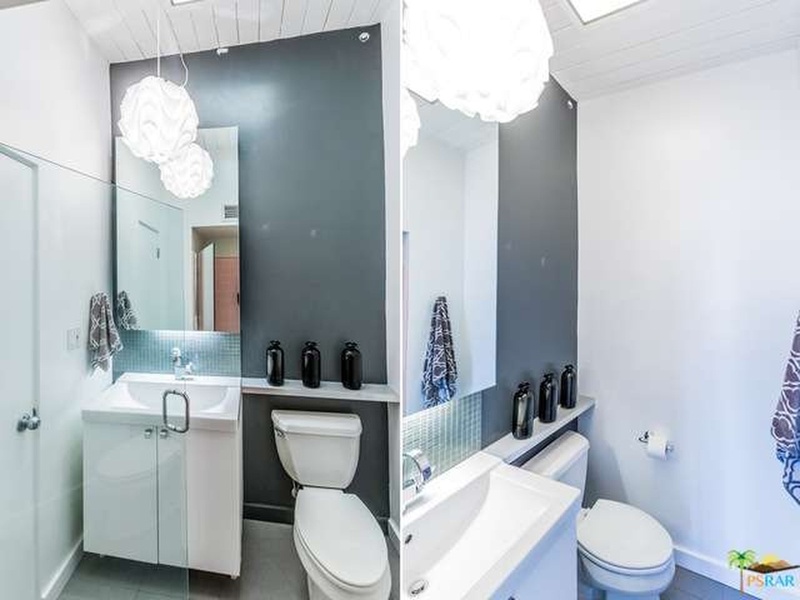 Both the master and secondary bathrooms have been updated with clean-lined vanities, mosaic tiles and a grey tiled surround in the master. 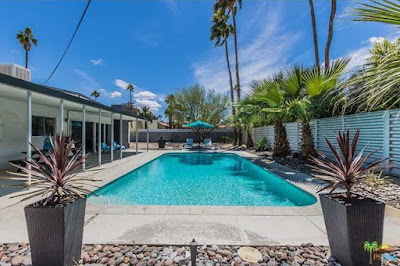 The backyard features its original 15’ x 30’ Alexander swimming pool at the center of the yard, and a large covered patio runs along the back of the home. 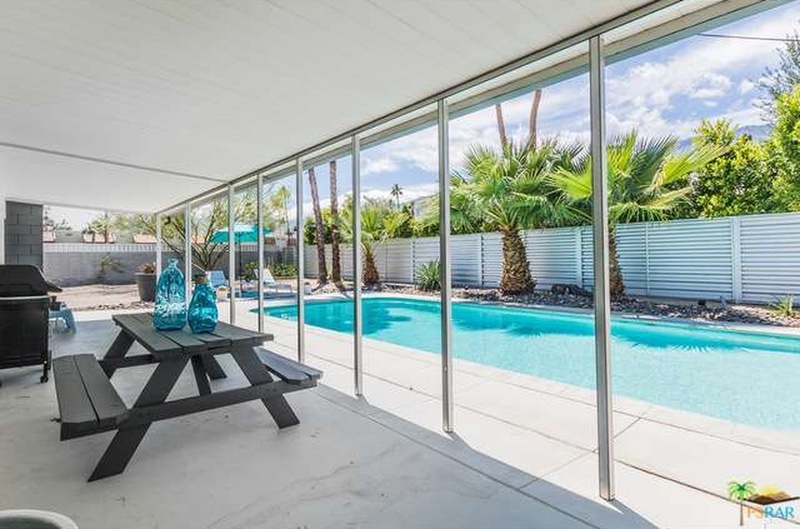 A sleek metal fence lines the rear wall of the yard, and a floating concrete pad serves as a convenient sun deck. 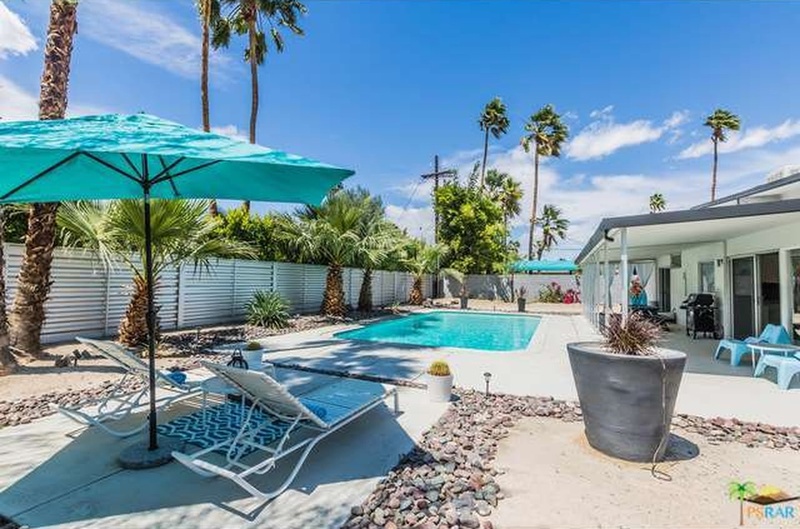 A variety of palms and decorative rock surround the pool, and distant views of Mt. 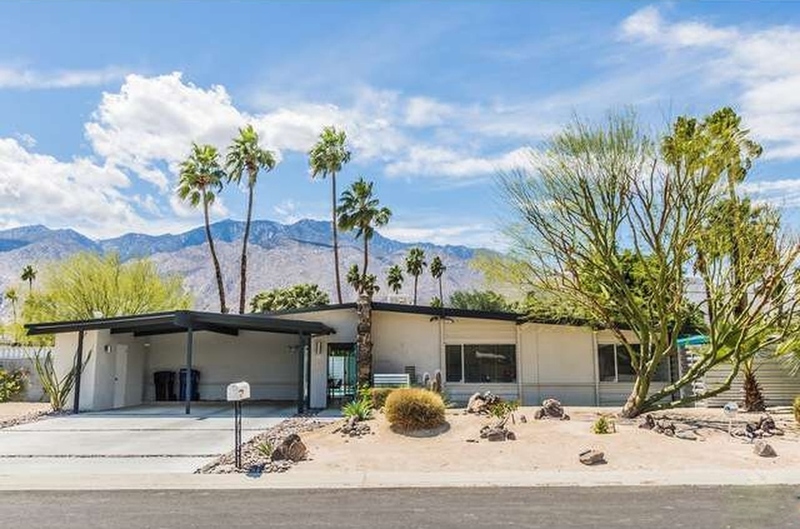 San Jacinto are provided above neighboring shrubbery. This Sunrise Park Palmer & Krisel is move-in ready, and offers a great opportunity for anyone looking to grab a slice of Palms Springs.